It was with great sadness that I heard Nitin Garg one of our recent graduates was killed in Melbourne. There has been a lot of commentary about how this tragic event will impact on international student numbers. Let’s just put that aside for the moment. Let us remember one of our graduates we have lost. This young man had the bravery to come to Australia to study in a country far away from home, to study in a language that was not his first. He was a young man who had succeeded with his studies. He had become an Australian resident and would have contributed much to his adopted country. So as a University we remember one of our own and express our deepest condolences to his family and friends. Christmas now seems a long time ago! The year has got off to a very busy start. I have been spending a lot of time looking at our applications. I am very pleased to see that we have a good increase in our applications for both domestic and international programs in Central Queensland. I think we are on track to meet our student targets for 2010 – which is great news. It is particularly gratifying to see so many people progressing from our access programs to full degrees. We now all need to work to make our new students feel welcome, and part of the University. We need to look into ways of engaging our new students. This will improve our retention rates – and more importantly improve the prospects of our communities. We should be thinking of innovative methods to achieve this – maybe by program and course coordinators setting up face book sites for their new students. We cannot afford to loose one student! The University is also buzzing with activity to develop new programs for introduction later this year and in 2011. Plans for new programs in health and law are well advanced. These new programs should help us to meet our targets as we move forward. They will also help us to develop our reputation as Australia’s most engaged University. Personally I have had a great start to the year – I have become a grandfather for the first time. 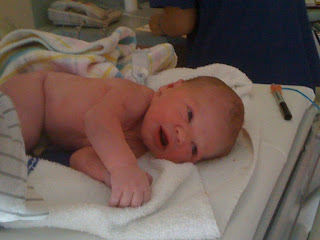 My daughter Anneka and her partner Matt had a baby boy (Owen – 8lb 6oz) on the 2nd of January. Anita and I are very proud grandparents. I could not resist including a picture in this blog. This will be a year when we will see renewal of our campuses, introduction of new programs, more collaboration with other Universities, a new EBA, greater partnership with the VET sector and many new staff joining us. This will be our year of big ideas. I think these ideas should come from all over the University. Ideas for how we can build this into a great University. I wish you all a very happy New Year – and I look forward to hearing your big ideas.